When I get breakouts I will not leave the house until I cover them up. My sisters can testify that I will sit in front of the mirror and even risk being fired from my job if I do not have every imperfection hidden before I leave the house. All I can say is blemishes are embarrassing and I don’t want to walk around all day with everyone staring at them. In any case…I have perfected the art of covering blemishes and covering them fast! 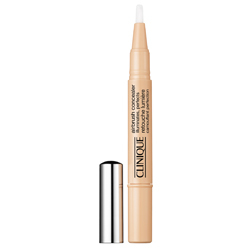 One of my best friends turned me on to Clinique’s Airbrush Concealer ($19 www.clinique.com) last year and I am addicted! This is like magic in a tube! If I am wearing a liquid foundation, I apply that first and let it set on my skin for a few minutes. Then I twist the concealer tube, it is a brush, but I don’t like to apply it directly to my skin, I put the amount I need on the back of my hand for the amount of coverage I think I will need. Then using my ring finger I apply the concealer to the blemishes. If you have a really bad blemish, you can build coverage with this and it works perfectly! Just let the first application sit for about 60 seconds before applying more. Before you know it all of your imperfections are perfectly hidden! Then you can gently set with your favorite powder. If you aren’t using liquid foundation then apply the concealer to the skin as above and then finish with your powder. This concealer is also great for the under eye area and I put it on my nose to help make it brighten up and smooth out my skin tone in that area. The texture is smooth and creamy and does not feel heavy on your skin. I have turned several people onto this in my office and I know you will love it too! !